Personalised Unicorn Cutout Birthday Card Rainbow design (Send message with order with your name choice) All Cards are individually Handmade 148.50 x 148.50 White 280gsm Card with Cutout wording and Unicorn with 280gsm Printed Rainbow background.155mm x 155mm White 100gsm Envelope and Cello Bag. 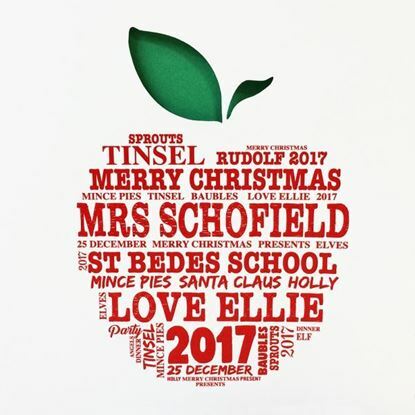 Personalised Teacher Christmas Card with cut out leaf and personalised child’s name, teacher & school All cards are individually handmade and cut one at a time Please message us with the following:- Your Child's Name Teacher's Name School Name All the other text is Christmas themed. Our Cards are printed on a 148.5mm x 148.5mm square High Quality Smooth Extra White with a 300gsm Green insert, includes 100gsm White Envelope & Cellophane Bag. Personalised Dinosaur Cutout Birthday Card Pale Blue (Send message with order with your name choice) All Cards are individaully Handmade 148.50 x 148.50 White 280gsm Card with Cutout wording and Dinasour with 280gsm Printed Dinosaurs background.155mm x 155mm White 100gsm Envelope and Cello Bag. Personalised Dinosaur Cutout Birthday Card Dark Blue (Send message with order with your name choice) All Cards are individaully Handmade 148.50 x 148.50 White 280gsm Card with Cutout wording and Dinasour with 280gsm Printed Dinosaurs background.155mm x 155mm White 100gsm Envelope and Cello Bag.